Increasingly, more of my peers are finding it difficult to relate to the younger people joining the workforce. The consistent rant is about Attitude. The disconnect seems to cut across all industries. The age group is usually those in early to mid 20s. No doubt, they will find the pigeonholing below quite condescending. 1. PLUGGED IN: They grew up around PCs, the net, mobile phones, video games, and mp3 players. They are web savvy multitaskers, are able watch TV, surf the web, listen to music, and talk or text on their phones, often performing several of these things at the same time. 2. TV ISN’T KING: Although you’ll find some Gen Y’ers obsessing over the latest episode of “The Hills,” and other shows, they aren’t watching TV as much as other generations do. They rather time-shift, download and watch episodes on their own terms. Gen Y’ers rather spend time using their Xboxes and Wiis even it cuts into TV viewing. For them, TV is often just “background noise”. 3.DON’T CARE ABOUT ADS, ONLY WHAT THEIR FRIENDS THINK: Because they are immersed in media, and marketed to constantly, they’re distrusting of ads. Instead, they respond to “humor, irony, and the unvarnished truth.” But when it comes to making decisions, they’re more likely to rely on their network of friends and their recommendations. Gen Y doesn’t have brand loyalty, however – they’re quick to move the next big thing. 4. WORK ISN’T THEIR WHOLE WORLD: They’re going to go to work, but it had better be fun. 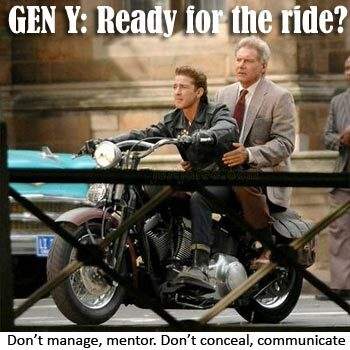 For Gen Y, work isn’t their identity. They’re also not going to blindly follow orders just because you’re the boss. “Generation Why?” needs “buy in”. Gen Y wants companies to be more accommodating, offering the ability to work from anywhere, flexi-time, a culture that supports team communication, and a “fun” work environment. Old school bosses may need this survival guide. 5. THEY’RE SOCIALLY CONSCIOUS: Gen Y cares about the world. They pay attention to politics, the economy, social causes, and environmental issues. They think they’re a force to be reckoned with in elections and follow the candidates online on social networks. They read the news, but not in newspaper format, which is is going to hurt that industry even more as time goes by. 6.THEY DON’T WANT YOU AS A FACEBOOK FRIEND: They’re wary of old folks, like their boss, trying to “friend” them in their social space, especially if they’re tragically un-hip wannabes. 54% have used MySpace, Facebook, or some other social network. Gen Y is getting into lifestreaming too, twittering and streaming live video. In their own world, they’re celebrities. Says Jason Barg, a 2004 graduate of Penn State University and founder of an online real estate company, notoriety is more about standing out from the crowd. “A primary goal of people my age is not necessarily to become famous but to become distinctive,” he says. 7. WORK TOOLS NEED TO MIRROR WEB TOOLS: Gen Y will drive adoption of “Enterprise 2.0″ products and services. Gen Y in the workplace will not just want, but expect their company to provide them with tools that mirror those they use in their personal lives. If socializing on Facebook or on mobile phones helps them get a lead, then they’re not going to understand why they can’t use it for work. For more buckled down companies, if workers aren’t provided with the tools they want, they’re going to be savvy enough to go around IT’s back and get their own. It’s 20:08, Do You Know What Your Kid Is Doing Online? My 11-year-old son asked me how to download videos and music from the Internet and within a few minutes I turned him into a pirate downloader using Ares and VideoDownloadX. I did a P.O.S just to see what his favourite searches were. They turned out to be: Soulja Boy and Breakdance. My nine-year-old daughter has also latched on to Flash games and social virtual sites Habbo and Zwinky, neither of which she’s old enough to sign up for. As long as they don’t start ordering pink convertibles, I guess we’re safe. An NPD Group survey of mothers of two- to 14-year-olds suggests the most popular digital activities are playing games, followed by listening to music and watching video (Note: reading not essential). They are also spending on average, US$6 to US$12 per month for digital content, a statistic obviously not lost on marketeers.